LiveDNS Review 2019: Is LiveDNS a Good Hosting? One of the leading web hosting, domain registrars and VPS companies in Israel, LiveDNS offers foolproof and reliable hosting solutions to customers in addition to high-level support. 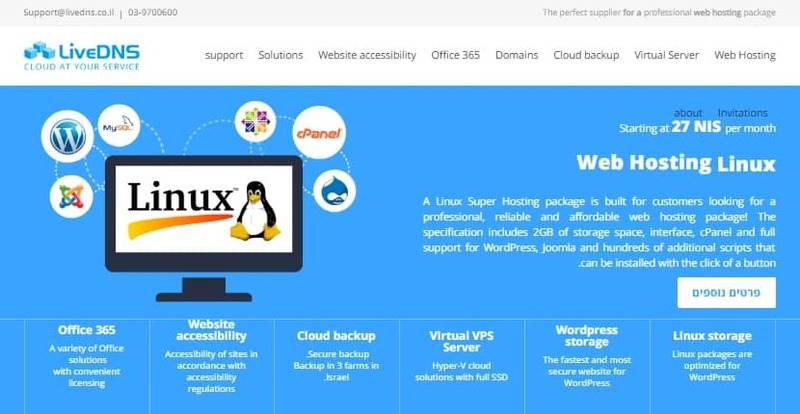 Based in Israel, LiveDNS is a top hosting company that offers a range of hosting services, cloud backups, and virtual servers in addition to domain registration services. They serve over 20,000 customers and their main servers are in 3 secure facilities. I have always held Israeli tech companies like LiveDNS in high esteem because they mean business when it comes to hosting. From the choice of hosting equipment to network connectivity and security, everything is top-notch. LiveDNS uses only high quality and reliable hardware with SSD storage from trusted brands, such as HP, Fortinet, and 3 PAR. Whether you choose the basic plans or the VPS, you’re assured of 99.9% uptime. Security is the third on my checklist (after usability and pricing) when assessing the suitability of a host. With LiveDNS, you will never have to worry about user security as they use Fortinet firewall system. Customers also enjoy full protection against DDoS attacks. What’s more, they monitor servers round the clock and neutralize threats before you are aware of them. LiveDNS offers a full suite of features to help you kick-start your web project. With Linux hosting and Windows hosting plans, you get a free web installer with 200+ scripts, Webmail and POP emails with anti-spam filtering, web based file manager, fast FTPs, MySQL databases, and subdomains among other resources. To top it off, they back up your files using .VEEAM. You shouldn’t have problems managing your website and web space. LiveDNS provides an advanced and secure dashboard that lets you manage your user and security configurations, files, databases, emails, and web apps from a central place. If you wish, you can get more space for your files and emails in addition to premium domains for a reasonable fee. Windows hosting plans are available to customers who prefer Plesk (management interface). These run on Windows Server 2008 R2 with IIS7.5 and are powered by ultra-fast hardware with SSD. When you sign up, you will get 3GB – 40 GB storage space, upto 20 GB monthly bandwidth, root access, ASP.NET and ASP in addition to Perl, CGI, and HTML. If you prefer CentOS, you can order the Super Linux hosting plans which come with the convenient cPanel. They’re not just stable and affordable but optimized for performance. With Linux, you get at least 2 GB storage space, 20 email boxes, 40 GB monthly bandwidth in addition to daily backups. Virtual servers (VPS) with hyper-v array and SSH/RDP access are also available. They offer various options for your enterprise apps, emails, backups, ERP and CRM, remote workstations, and ecommerce websites. Designed with performance and security in mind, these servers can handle just any kind of workload. LiveDNS’s customers enjoy fast and efficient support in addition to real time service monitoring. Sales and billing staff are friendly and super responsive. They also have an onsite technical team that can assist you to resolve your hosting problems, DNS issues, or handle your website and database migration. You can contact support using email, online messaging form, telephone, and live chat. If you’re looking for fast, feature-rich, and reliable Linux or Windows hosting packages with Israeli IPs, LiveDNS is an exceptional choice. Wondering how LiveDNS stacks up against other Web Hosting companies? Enter any other Web Hosting company and we will give you a side-by-side comparison.